Cyber Monday is here! 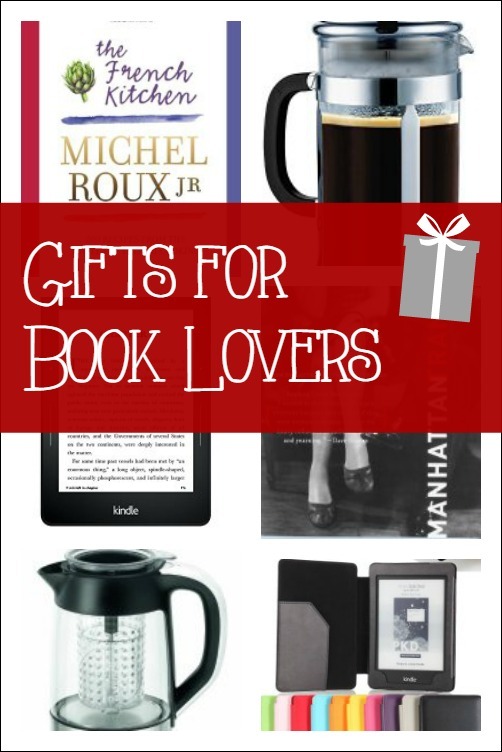 So if your typing fingers aren't worn out yet, we'd like to recommend a few gifts for the book lover on your list. Or, if you're a book lover yourself, you might want to add these to your wishlist! Exquisite photos, luscious classic recipes such as Lyonnaise onion soup and the charming French chef Michel Roux Jr. Who could ask for more? Take a step back to New York in the '20s. One of our favorite places. One of our favorite eras. Enough said. Nothing like curling up with a cup of tea and a good book. We've added this tea brewer to our list! For coffee + books, a French press is the way to go! Crack open your book and pour yourself a cup from this gourmet coffee press, and you'll be transported to a Parisian sidewalk cafe! We love the simplicity of the Kindle Paperwhite--we have enough distractions as it is, and when we sit down to read, we just want to read! The paperwhite is a great transition for print-book-lovers into the digital world. The lucky recipient of the Kindle Paperwhite (above) will want to protect it. So throw in this cover as a bonus gift! The easy part? Choosing this cover. The hard part? Choosing which color! Happy reading, and happy holidays from Velvet Morning Press!